Willie Mackie, Chair of Ayrshire College and a member of the Board of Skills Development Scotland, shares his thoughts on the importance of modern apprenticeships. Scottish Apprenticeship Week is one of the most important and inspiring weeks of the year, as colleges and other training providers across Scotland promote the benefits of investing in apprentices. There is nothing more inspiring for me as Chair of Ayrshire College, and as a board member of Skills Development Scotland, to see first hand the positive impact the modern apprenticeship programme can have on our young people. The College is a major provider of apprenticeships in Ayrshire and has supported 1,000 apprenticeships over the past 20 months. 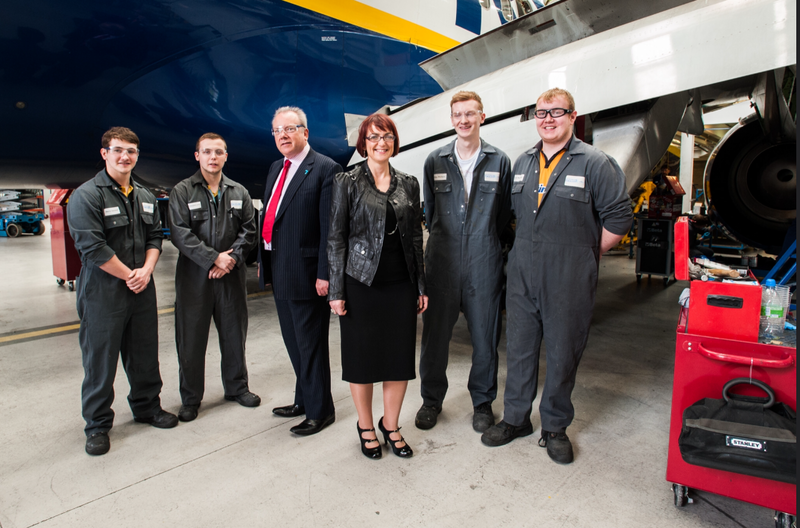 Since August 2013, I have had the great privilege of meeting many of the apprentices trained by the College like the aircraft engineers at Prestwick Airport Maintenance below. The highlight of a recent visit to Rosyth to see the excellent programme run jointly by Fife College and Skills Development Scotland to pilot the new foundation apprenticeship was a discussion with students who were very happy to share their experiences. Not only were the students enjoying the work experience, but the programme was also building their self-confidence and social skills. The partnership approach in Fife, where private and public sector partners work collaboratively in pursuit of a common goal to develop the young workforce, is one which underpins the ethos of Ayrshire College. This year, in partnership with North Ayrshire Council, the College established an innovative skills centre of excellence located on the campus of Irvine Royal Academy. Nearly 300 students have studied hospitality, sport and care courses at the centre this year, and from August young people at school will be able to participate on a wide range of courses including an engineering foundation apprenticeship supported by Skills Development Scotland. One of the apprentices I met most recently was Dale Dunlop who, in his sixth year at Irvine Royal Academy, attended Ayrshire College two days a week to study a Performing Engineering Operations course. This experience led to Dale being offered a modern apprenticeship at TPS Weldtech, and he and his employer talk in this video about the benefits for both of them. It is no accident that where such collaboration exists the modern apprenticeship programme flourishes and I see it as a key responsibility of mine to encourage as many students, as many businesses and as many stakeholders as I can to proactively engage in this wonderful programme. I have been very fortunate over 30 years to have had direct contact with businesses of all shapes and sizes. I have met many inspiring business leaders who freely give of their time to meet students and/or invite them to see their businesses or spend time on the shop floor. I very strongly believe this early engagement with business can inspire students to think differently about their chosen career path. SDS and colleges across Scotland are focussing more and more on early intervention in schools and through the senior phase to highlight the significant career opportunities which exist within vocational education and training. Capturing real life examples is a much more impactful way of getting these messages across and I am delighted to see new video case studies appearing on the Ayrshire College website throughout the week – I would strongly recommend an early viewing! Thanks to a revolution in technology and how we are able to communicate (this blog being a good example) our ability to encourage, motivate and inform students and employers about the modern apprenticeship programme is only limited by our imagination. On a personal note, I will be shouting about the modern apprenticeship programme this week and I hope you will be too! For anyone who is thinking about enquiring or finding out about the Modern Apprenticeship programme I would encourage you to make the call, send the email – you will find someone who is enthusiastic and who can help guide you to the most appropriate place. If you live in Ayrshire, contact Stuart Cree at the College by email at stuart.cree@ayrshire.ac.uk. Most importantly good luck in your endeavours, it will transform your life! Apprenticeships, Developing the Young Workforce, Scottish Apprenticeship Week 2015, Start Here, Go Anywhere!